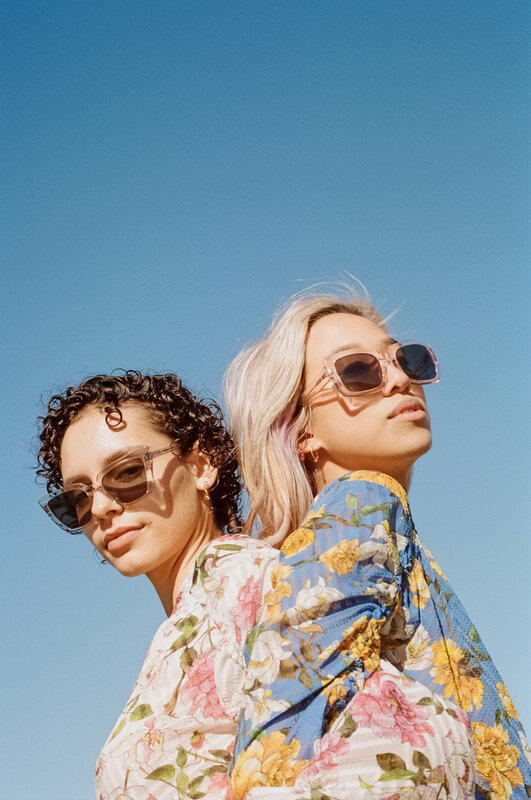 The first injection of Kate Sylvester’s Spring eyewear collection has just landed and features five optical frames, and three new styles of sunglasses. Maya wears Peggy frames, Rainy wears Dorian frames - campaign imagery, Chloe Hill. The collection offers strong, feminine shapes imbued with Kate’s understated, effortless aesthetic and introduces pops of rose pink and vibrant green alongside a tonal colour palette in a beautiful and intelligent collection. Nya wears Peggy frames - campaign imagery Chloe Hill. As an avid reader, Kate has named her optical frames after authors she loves including the beautiful Miranda (Miranda July), Blake (William Blake), Leo (Leo Tolstoy), Lewis (Lewis Carroll) and Renata (Renata Alder) frame. The sunglass frames are named after some of Kate’s favourite book characters (fiction and non-fiction) and this season’s heroes are Holden (Caulfield), Dorian (Gray) and Peggy (Guggenheim) worn here by the beautiful Nya in smoke.